gabon Archives - Africa M.E. LIBREVILLE (Reuters) – Gabon accused French environmental services group Veolia on Tuesday of widespread pollution at SEEG, the power and water utility it operates there, amid a growing dispute over the company’s concession. Veolia, which has already threatened legal action after the government seized SEEG earlier this month and said it would cancel its concession, rejected the accusations. Speaking to reporters in the capital Libreville, government spokesman Alain-Claude Bilie By Nze said an environmental inspection of power and water pumping stations discovered “nearly all” SEEG sites were contaminated by petroleum waste. “This is a very serious situation since, at this stage, aside from the obvious environmental damage, no one knows the consequences this pollution could have had or could have on public health,” he said. He said that on top of legal penalties of up to 500 million CFA francs ($946,110) for each polluted site, Gabon would force SEEG to shoulder the clean-up costs. Responding to the accusations, Veolia stated that the water it distributed continued to conform to World Health Organization standards and Gabonese regulations. 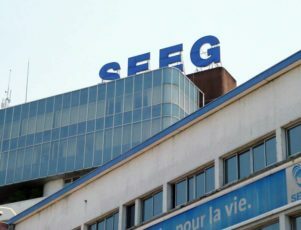 Negotiations between the government and Veolia over the concession broke down in October, and authorities seized SEEG earlier this month, citing years of poor service quality. Veolia in turn blamed the government for failing to live up to its investment obligations, and on Tuesday said the state owed SEEG over 29 billion CFA francs in consumption charges and unpaid value-added tax reimbursements. Gabon spokesman Bilie by Nze said the government had called for an audit of its 13 billion CFA consumption bill. He rejected accusations it had neglected SEEG and said the state had invested around 1 trillion CFA francs in the company, around three times more than Veolia. The collapse of oil prices has plunged this small—and potentially wealthy—Central African state into a prolonged financial crisis and Bongo’s regime has been unable to resolve it. Gabon’s government had juste illegally seized French environmental services group Veolia’s SEEG unit and intends to terminate its contract to distribute water and electricity in the country: the latest in a larger, overarching economic and political crisis. Gabonese President Ali Bongo has known of Gabon’s suffering from a prolonged economic crisis since 2014, when a steep drop in oil prices hit the oil industry worldwide. At the time, he told French journalists: “The shock of falling oil prices is tough for Gabon”, speaking of the OPEC member state; a major oil-producing country in the Gulf of Guinea. Production in Gabon is in decline. The recovery is slow and may not come at all. In the past five years, the oil sector accounted for 80 percent of exports, 45 percent of gross domestic product, and 60 percent of budget revenue, on average according to World Bank data. With revenues declining and the population feeling the squeeze, Ali Bongo faces the strongest opposition in years, plus some social upheaval, including a spate of strikes in the private sector and public services. Teachers, magistrates and customs officials all demand an improvement of their working conditions and the payment of several months of wage arrears. The budget was cut by over 5 percent in 2017 because of declining oil production and prices. Income per capita rocketed from $3,090 in 2000 to $10,410 in 2014 as oil prices shot higher. But as oil prices slid, it fell in 2015, for the first time in 15 years. “Depleting oil revenues are pushing Gabon’s economy towards the cliff edge” said Maja Bovcon, senior Africa analyst at global risk firm Verisk Maplecroft. 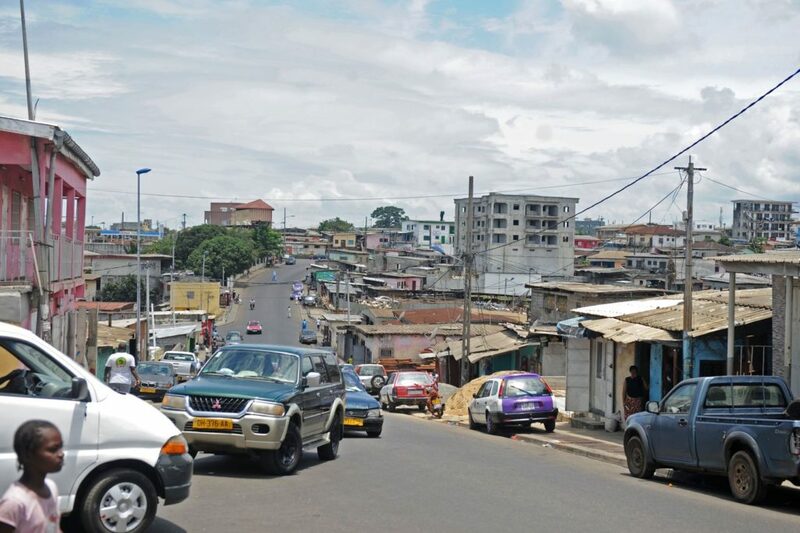 Scene of daily life along a main street of Libreville, the capital and largest city of Gabon. As a result, and for the first time in Gabonese history, on June 19, 2017, the International Monetary Fund (IMF) approved a three-year extended arrangement (from 2017 to 2020) under the Extended Fund Facility (EFF) for Gabon for $642 million. Gabon is also still reeling from a disputed election in August/September 2016 that turned violent in the coastal capital Libreville, harnessing anger among poor people, who say oil revenues never trickle below the Gabonese elite. Since he was first controversially elected in 2009, Ali Bongo, whose family has ruled the country of nearly 2 million since 1967, has said he will diversify the economy beyond oil into industry, mining, forestry and agriculture. He aimed to rein in spending and increase social programs, though it is unclear how much progress has been made so far. The last Gabonese presidential election was marred by numerous inconsistencies, arrests, human rights violations and post-election violence. Bongo was initially handed victory, after surprising results in the eastern Haut-Ogooue province, but opposition leader Jean Ping called the election a sham, declared himself president and demanded a recount. The Haut-Ogooue is the native province of the Bongo family where initial results showed Ali Bongo won 95 percent of the votes on a 99.9 percent turnout.The case went to the Constitutional Court (chaired by Marie-Madeleine Mborantsuo, a close relative of the presidential family) which ruled in Bongo’s favor. Protesters in Libreville against Gabonese President Ali Bongo, after the 2016 presidential election. Today, the business climate in Gabon is in particularly bad shape: endemic corruption, numerous strike actions by employees of both the Government and the private sector, unpaid wages in all sectors, an increasing number of overdue invoices, and so on. “Gabon does not have a good reputation for doing business, but with the oil crisis, the situation has worsened: the Gabonese State shows the highest share of long overdue receivables, pushing companies like Sodexo or Veolia to engage in a power struggle, or leave the country” confides a senior executive working for a major bank in Central Africa. 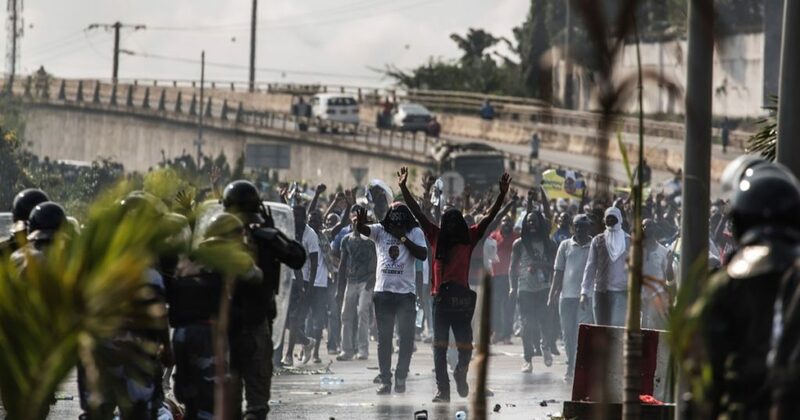 The French credit insurance company Euler Hermes is worried about the consequences of “the current political turmoil in Gabon (…) Political uncertainty is not appreciated by investors, and negatively affects their confidence. Without these investors, it will be difficult for Gabon to finance the diversification of the national economy. Moreover, Foreign Direct Investment (FDI) has already decreased by 38% in 2015”. The conflict unleashed by the Bongo’s regime against Veolia’s SEEG unit is the most recent episode of the economic uncertainty in Gabon. “The liquidity crisis forces the Gabonese Central Bank to put in place capital controls without saying so; businesses have a hard time getting paid by the state and getting foreign currency” emphasises Stéphane Colliac, senior economist Africa at Euler Hermes. The Gabonese State has debts due or payable to Veolia-SEEG: 62 million euros, according to the information supplied by Helman le Pas de Sécheval, secretary general of Veolia, to the Agence France Presse (AFP). 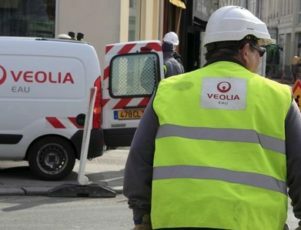 At the end of 2016, Veolia-SEEG already claimed 100 million euros in arrears. 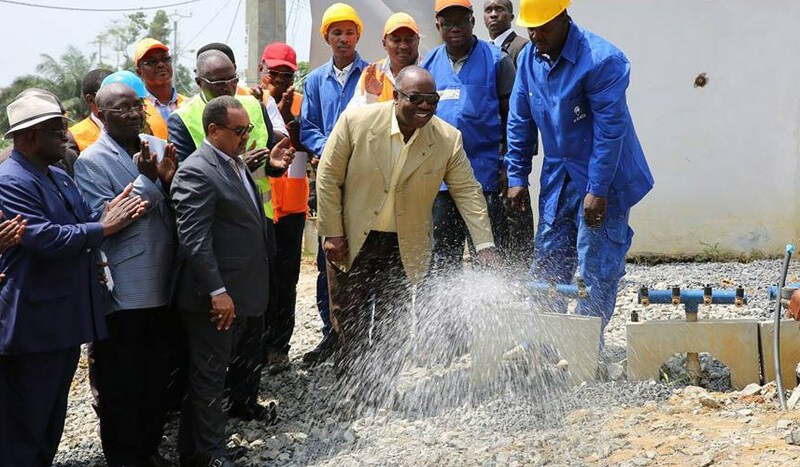 Ali Bongo inaugurates new hydraulic facilities built by Veolia-SEEG in Libreville, in 2016. Veolia, which provides drinking water to 100 million people across the world, has been operating in Gabon since 1997 via the Société d’eau et d’électricité du Gabon (SEEG) which is a co-ownership (Veolia owns 51 percent, the Gabonese State, and others, own 49 percent). On Friday 16th, February, Gabon’s government intended to terminate this cooperation through the Water and Energy Minister, Patrick Eyogo Edzang: “In the interest of preserving continuity and quality in the public provision of drinking water and electric energy, the Gabonese state has proceeded exceptionally to the temporary requisition of the company”. Veolia-SEEG said it “regrets the sudden decision taken… to break the concession’s convention and the brutal use of Gabonese forces who requisitioned the enterprise”. Several specialists in Gabon’s economy are worried about by the Government’s decision: “The concerns are legitimate. The state took a significant risk by cancelling Veolia’s contract without a new partner. In addition, the brutal method employed may seem like a foil to some investors who might have been interested. Such decisions impact the business environment and challenge the ability of the Gabonese government to meet its contractual commitments” said Mays Mouissi, a well-recognized economist from Gabon. The brutal breach of contract with Veolia is “a very bad signal sent to potential foreign investors,” regrets Mr. Ntoutoume Ayi, an economist close to Jean Ping, the main opponent of President Ali Bongo. Helman le Pas de Sécheval, secretary general of Veolia, shares this view: “Veolia is taking all necessary measures to enforce the law (…) This illegal expropriation and inconsistency of the Gabonese government will hurt not only Gabon but also Africa as a whole. The water and energy sectors demand vision, long-term investments and stability. This is what international investors expect”. Gabon needs to pay attention to its international reputation and business climate. In an extreme case, foreign firms could refrain from investing, while domestic ones could flee the country for a more peaceful environment. The West African nation becomes the smallest producer of oil in the cartel, producing only 200,000 barrels a day. More than 20 years after Gabon left OPEC in a dispute over its budget contribution, the West African nation has rejoined the oil cartel. Gabon returns to the Organization of Petroleum Exporting Countries amid a two-year oil glut that has reduced the cartel’s power to prop up global oil prices. Gabon was the second former member to rejoin OPEC this year, following Indonesia, which quit in 2008 then returned in January. Gabon is the smallest producer among OPEC’s 14 member countries. It produces 200,000 barrels of oil per day, but according to the International Energy Agency, the nation’s output is declining. 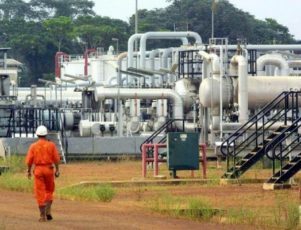 Gabon, which joined OPEC in 1975, left in 1995 after the cartel refused its request to reduce its financial contribution to the organization, making it more proportionate with its production. At the time, Gabon produced about 340,000 barrels of oil per day, about one percent of total OPEC production. Like other OPEC members, Gabon is struggling with the slump in global oil prices, and rejoining the cartel enables the country to strengthen its ties with countries that share similar challenges. In response to the slump, Gabon is also working to shift more of its economy to agriculture. The nation, with a population of less than 2 million, currently imports nearly all of its food. Working with Olam International Ltd., the Gabonese are trying to persuade young people to take up farming. As part of the effort, about 2,500 Gabonese will observe cocoa farming in Ivory Coast, learn techniques at a palm-oil plantation in Asia, or train as bulldozer operators in Morocco, Gupta said. Olam also will work with Gabon to develop nearly 250,000 acres of oil-palm plantations. According to the World Bank, Gabon is an upper-middle-income country that experienced strong economic growth during the last 10 years, mostly from oil and manganese production. In 2015, oil accounted for 70% of Gabon’s exports, and 20% of the nation’s gross domestic product. Economic growth weakened to 4% in 2015 because of the drop in oil prices, forcing the government to cut investments designed to promote economic diversity. Even though Gabon’s economy has been growing, it has failed to create enough jobs, the World Bank said. Unemployment in 2010 was more than 20%. OPEC, meanwhile, has seen its global clout diminished. The cartel has attempted to negotiate a deal with Russia to freeze production levels in order to prop up prices. However, OPEC disunity has stalled the effort so far. In June, Venezuela oil minister Eulogio del Pino said talks might revive in September, when Iran reaches pre-sanction output levels. Iran, freed last year of international sanctions that limited production, has sought to boost output and has resisted limits. Del Pino said he also would propose that OPEC adopt “production ranges” that would allow production to fluctuate, rather than talking about an unpopular production ceiling. Venezuela has suffered badly from the oil price collapse production declines. Del Pino said recent rains that helped power production have prompted a recovery. In 2014, OPEC abandoned its policy of limiting oil production to shore up prices. Steep price declines followed. Oil, which sold for $110 a barrel in 2014, slumped to a low of $26 per barrel earlier this year. It recovered somewhat this spring with prices mostly in the range of $45-$50 in recent months. OPEC nations, led by Saudi Arabia, have been willing to absorb the financial impact of plummeting oil prices in order to preserve market share and hurt competitors with higher productions costs, such as U.S. shale producers. OPEC also accounts for a smaller share of global production that in the past, when the cartel dominated the marketplace. Total OPEC production is nearly 37 million barrels a day while non-OPEC production is nearly 57 million barrels daily, according to Global Risk Insights. The African nation looks for private investment as it creates infrastructure to grow timber and mining production. Gabon is making progress with its ambitious strategy of industrializing its economy by 2025, but plunging oil prices may slow its advances. Gabon’s goal of economic diversification took on new urgency in 2015, when the plunge in oil prices sent shock waves through the economy of the nation of 1.8 million people located on the Atlantic coast of equatorial Africa. In 2010, Gabon adopted a sweeping Strategic Plan Emerging Gabon, designed to diversify its economy and make its industry more competitive. With 80 percent of its export revenues coming from oil, the country is attempting to increase timber production and mining. The plan calls for major investments in infrastructure and services to establish the Gabon Special Economic Zone with as many as 10 economic areas around the country. Gabon’s industrialization plan relies heavily on improving the timber industry. Forests cover nearly 85 percent of the country and it is home to more than 400 tree species. In 2010, the government decided to halt exports of raw logs as a way of encouraging domestic processing, which would in turn increase profits and create more jobs. By 2012, about one third of logs were being processed in Gabon. France is the largest importer of processed wood projects from Gabon, accounting for 42 percent of sales while Asia accounts for 3 percent. Since the halt, timber revenues have tripled from $66 million in 2009 to $190 million in 2014. Gabon also created a special economic zone, Nkok, in Libreville, to make it easier for foreign companies to do business in the country. The Nkok zone attracted 62 investors in 2013, including 40 percent in the timber industry. The number of timber processing factories increased from 81 in 2009 to 114 in 2013 while the number of jobs nearly doubled to more than 7,000. The boost in the timber sector also resulted in the startup of transportation companies to haul logs. Mining is another sector that Gabon is attempting to grow. Following the creation of a metallurgical complex in Moanda, production of manganese increased to $305 million. At the same time, the country went from small-scale production of gold – about 30 kilograms in 2009 – to produce more than 1,200 kilograms in 2014. The economy grew about 4.1 percent in 2015, and the African Economic Outlook projected similar growth in 2016. Nevertheless, Gabon’s economy “is facing mounting headwinds,” the International Monetary Fund (IMF) said in early 2016. According to the IMF, falling oil prices have resulted in a slowdown in non-oil sectors including construction, transportation and services. The slowdown has led to a government budget deficit of 2.3 percent of Gabon’s gross national product in 2015, after posting a surplus of 2.5 percent the year before. At the same time, the nation saw a trade deficit of 1.9 percent in 2015 compared to a surplus of 8.3 percent in 2014. The IMF predicted economic growth of only 3.2 percent in 2016, largely because of declining oil production. However, growth in the agricultural sector could help increase the growth rate to about 5 percent in 2017-18. IMF directors noted that Gabon has made progress authorities in developing the country’s infrastructure since 2010. They emphasized the need to continue to foster diversification so that Gabon will be less vulnerable to fluctuating oil prices. As revenue to the government tightens, IMF directors recommended that Gabon officials focus on high-impact infrastructure projects and structural reforms that will increase productivity and improve the labor force. At the same time, Gabon officials have acknowledged that the regulatory environment could be better for business. Gabon President Ali Bong Ondimba pledged to “radically improve” the business climate by streamlining the regulatory process for investment through a National Agency for Investment Promotion and with establishment of a National adjustment for Competitiveness Pact to facilitate and speed up establishment of business operations. Ondimba said the country must encourage private investors to step up as public investment declines. “We must ensure that everyone plays their part. The government facilitates the business environment and the private sector that invests and recruits. If everyone plays his role, we will (achieve) growth and the creation of 20,000 jobs per year,” he said. One bright spot for investment in Gabon’s efforts came in April, when AFRICA Finance Corporation, based in Lagos, Nigeria, announced it was investing up to $140 million in the Gabon Special Economic Zone to help fund infrastructure projects including a new mineral terminal. 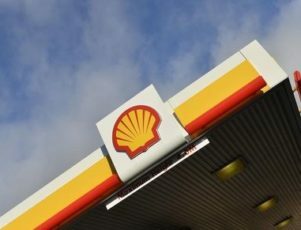 CAPE TOWN (Reuters) – Royal Dutch Shell’s Leopard Marin discovery offshore Gabon may be a new commercial gas field, a senior company executive said on Thursday. 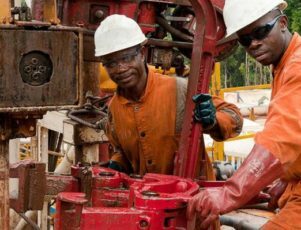 “Leopard is the first potentially commercial multi-TCF (trillion cubic feet) find in a new gas play and I think that is very exciting for us and for the government of Gabon,” Alastair Milne, Shell’s vice president exploration for Sub-Saharan Africa, told an industry conference in Cape Town.